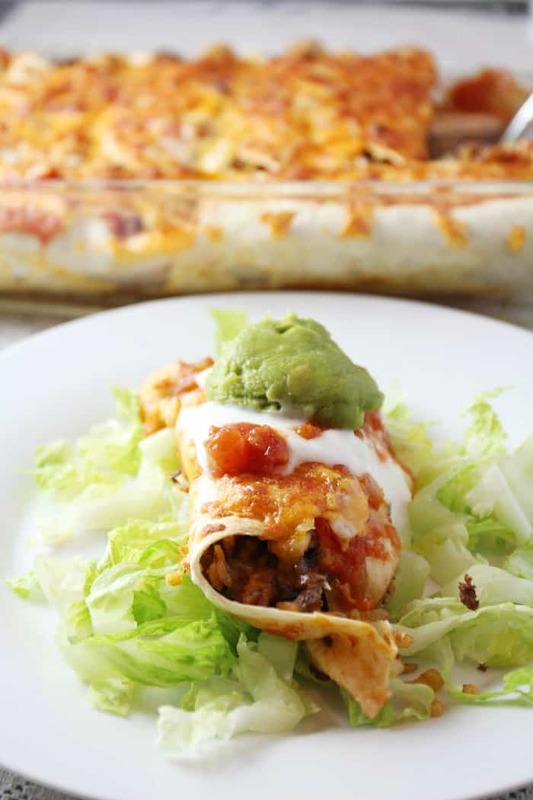 These CHEESY BAKED BURRITOS are so easy to make for a busy weeknight meal. My family loves them, and I love how quick they are to prepare. That golden, bubbly cheese on top is always a hit. Everyone wants the burrito with the most cheese smothered on it. I can’t say I blame them. Fry chopped onions in oil over medium heat for 5 minutes. Add ground hamburger and fry till done. Mix in the seasoning, rice and 1/2 cup salsa. In a 9×13″ pan put approx 2-3 tbsp of the extra salsa into the bottom of the pan just to coat the pan lightly. 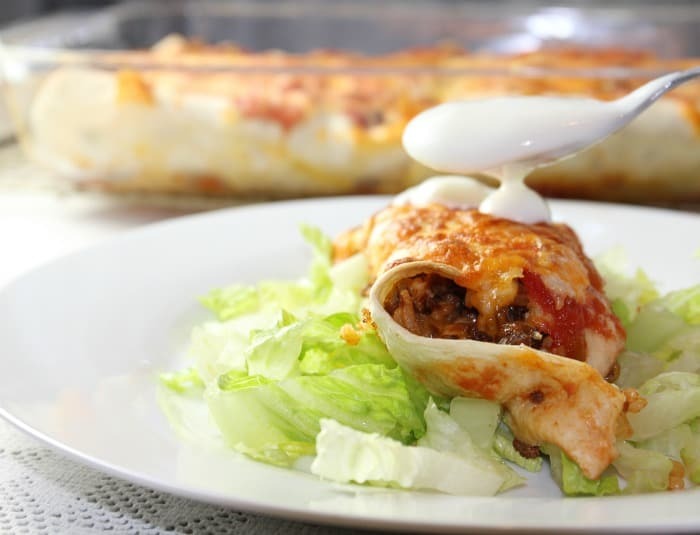 Put beef mixture into the shells, add about a tbsp of grated cheese to each one and place in them in the pan. I normally fit 6 the long way and then the last 2 along the edge. 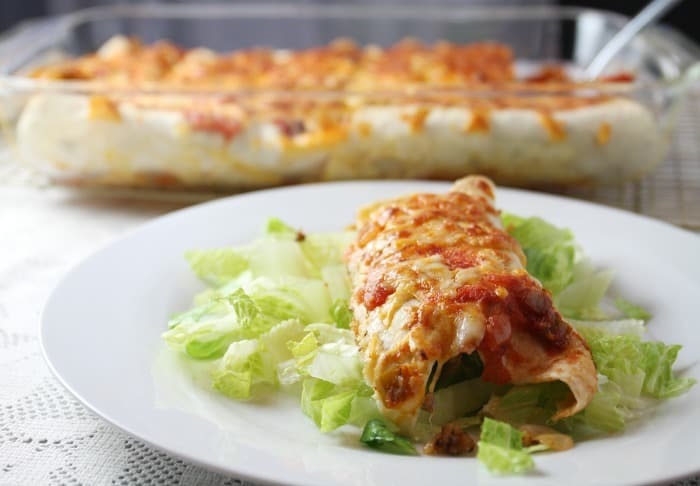 Cover burritos with remaining salsa and cheese and bake at 375 for about 20 minutes or until the cheese is nice and bubbly and the edges of the shells are golden brown. Let pan sit for 5 minutes before serving. Serve on a bed of lettuce, topped with sour cream and guacamole as desired. For the burritos, I do not fold them up. Instead, I roll them, that way if any of the filling falls out while eating, it tastes great mixed with the lettuce and toppings that are left on the plate. There you have it, a delicious, easy weeknight meal the whole family will love. Drool..this looks delicious, weekend dinner, thanks! Looks so good, I think we can make these. Nice easy recipe but it looks soooo tasty! See a recipe you like, what do I do same day I make it. My brother in law is very sick in hospital so I made this recipe up yesterday and took it to my sister’s so her family would have supper ready and her not worry what to cook after spending all day in hospital. It was a success! It was so easy to put together. That looks so good! I have never made burrito before time to try! Mmmh, I think I’m going to make these for supper. Thanks for the recipe. I made them again for my son in law this time and he sent me a text saying they were amazing! This was the first burrito recipe that I was tempted to open, read and save to my ‘to cook’ folder. Thank you! Love how easy and quick this recipe is; I don’t like complex recipes for the weeknights. I will have to try this one. 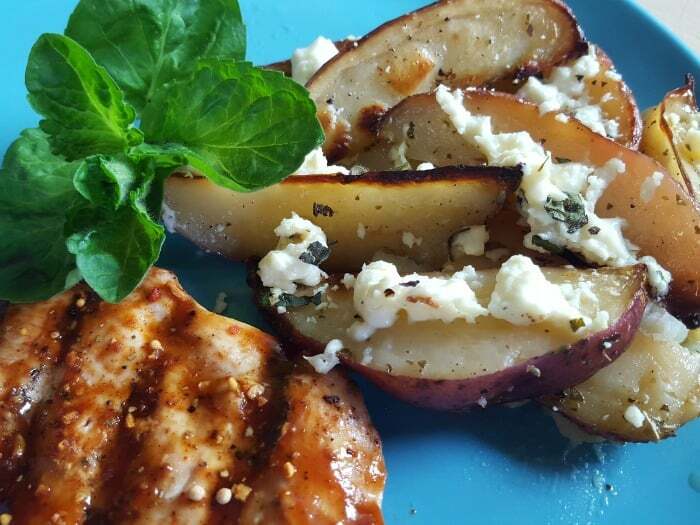 And the Baked Greek Feta Potatoes. Thanks! 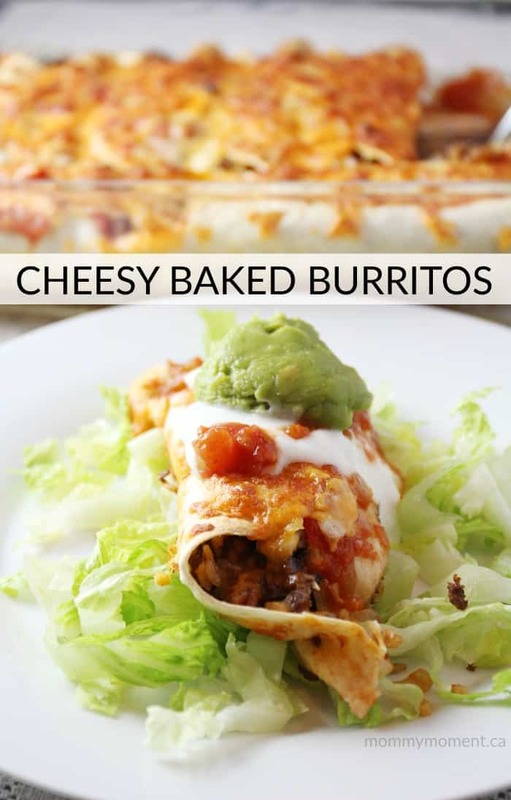 So need to try these Burrito’s! I love burritos and have all the ingredients so this will be supper tonight. That’s a little taste of Mexican heaven right there!